Did you know that every year over one million KitchenAid stand mixers are sold AND NOT A SINGLE ONE WITH FLAMES!!!! Only you can put a stop to this tragedy. By making a small, non-tax-deductible donation through the PURCHASE link, we can start the healing process one mixer at a time. Live juicy. Flame it up! 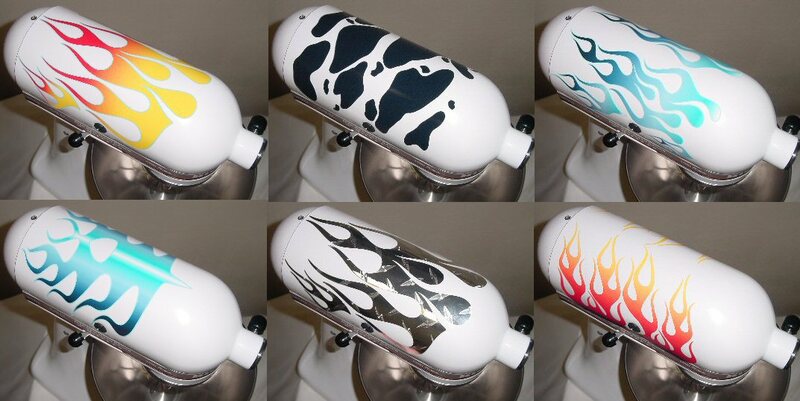 Embellish your kitchen stand mixer in an instant by adding these custom designed Flames!! Custom painting at a shop costs around $150, save money and time with this high quality kit. Flame yours with the magic of INSTANT GRATIFICATION! I put them on my mixer, and so should you. It gets tons of attention like your mixer should! Don't Believe Me! Believe the Sales Pitch Below! You can not buy a long lasting, great looking, one size fits all, inexpensive, easy to apply, designed just for KitchenAid stand mixer FLAME KIT anywhere else. We tried car decals, magnets, cling ons, you name it, so we came up with these after two years of work. So hey, go ahead, waste your time on those other unhappy solutions, or just buy these and get on with your life and loving your mixer. The Flame kit fits on the KitchenAid (Kitchen Aid) Classic, Artisan, 4, 4.5, 5, 6 qt (quart), Professional, Pro 600 and won’t interfere with your accessories, the Pasta Maker, Food Grinder, Juicer, Can Opener, Ice Cream Maker, Sausage Stuffer, Slicer Shredder, Grain Mill, extra bowl, mixer cover, or pouring shield.